Rayon Batik Beach Pareo from Java Indonesia The Batik Sarong Manufacturer Company. 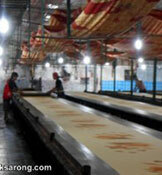 Sarongs factory in Indonesia. Producer and exporter of beach sarongs. Sarongs made of rayon fabric. Batik sarongs made in Indonesia.